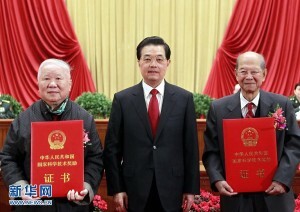 Jialin Xie, professor at the Institute of High Energy Physics (IHEP) and Academician of the Chinese Academy of Sciences (CAS), was awarded the State Top Scientific and Technological Award and a bonus of five million yuan by President Jintao Hu at a ceremony held in the Great Hall of the People in Beijing on 14 February. China has given its annual award to elite scientists and researchers for twelve years. Till now 20 laureates have been honoured for their contributions to China’s science and technology progress in diverse fields including mathematics, agriculture, physics, geology, computer science, aerospace science and medicine. Professor Xie was born in Harbin, Heilongjiang province in August 1920. He graduated from Yanjing University in 1943 and moved to the United States for further study. At Caltech, Xie obtained his M.S. degree in physics in 1948, and in 1951 he received his PhD from Stanford University. From 1951 to 1955, he worked at the microwave and high-energy physics laboratory at Stanford University. Then he was in charge of building an accelerator at Michael Reese Hospital in Chicago, which was the highest-energy (45 MeV) medical accelerator in the world at that time. In 1955, Xie was determined to return to China despite the offer to become a permanent US citizen. “My knowledge was crucial for China, which was an underdeveloped country at that time,” Xie said. “I came back because China needed young people to contribute what they learned for the country’s development and I was eager to do my part.” Athough he faced many difficulties during that time, including a lack of proper equipment and up-to-date information, and even continuous exposure in a dangerous environment putting his life in danger at times, Xie determined to go on with his research. “These difficulties were nothing for someone who wished to achieve something important,” he said. 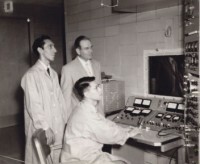 Following successful prefabrication research on various components of an electron linear accelerator, such as an electron gun, accelerating tube, high-power pulse modulator, microwave system and high-power klystron, he built a 30-MeV electron linac in 1964, the first one ever built in China. The successful construction of China’s first high-energy electron linear particle accelerator led to Xie being awarded the Scientific and Technological Achievement Prize at the National Science and Technology Conference in 1978. From 1981 to 1986, Xie led the design, pre-research and construction of the Beijing Electron Positron Collider (BEPC) and was appointed project director. He made important decisions on the requirements of BEPC subsystems and made key decisions as scientific manager. In October 1988, with the collisions of electrons and positrons, BEPC declared the construction a success. It was regarded as a good example of the realization of the reform and open-door policy of Chinese government and international collaboration of science and technology. Its luminosity was four times that of SLAC’s SPEAR, and the precise measurement of the tau mass carried out at BEPC aroused world attention. 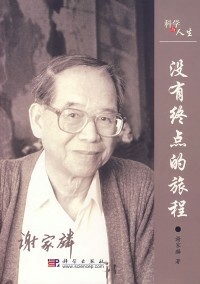 In 1990, Xie was awarded a Supreme Prize for National Science and Technology Progress. On learning about the establishment of free-electron lasers around the world – the latest development in the field of science and technology – Xie proposed the development of the Beijing Free Electron Laser and then worked out a concrete scheme. Using funds provided in 1987 under the State 863 High Tech Program, he succeeded in building China’s first infrared free-electron laser, which produced spontaneous emission in May 1993; the lasing reached saturation at the end of 1993. Following those built in the US and western Europe, this was the first infrared free-electron laser built in Asia. In 1994, he was awarded by CAS the Supreme Prize for Science and Technology Progress. Xie attached great importance and concern to the accelerator development strategy in China. He repeatedly made ​​important recommendations on the long-term development planning and guidance of accelerator developments, playing a major role in that area. He also held a positive view of the ILC and promoted the first CCAST ILC Accelerator Workshop held in Beijing 2007. Besides contributing research work, Xie has nurtured a great number of accelerator-specialised experts. “Professor Xie is a great teacher, a well cultivated gentleman, both in Chinese and western terms, and a lifelong friend,” said Jie Gao, professor at IHEP and one of Xie’s students. Xie often warned young scientists to learn with their own hands and brain. “Equipment is the material basis for innovative research. Although much of today’s equipment has become an industrial product, it is only limited to the standard equipment. The equipment needed for truly creative scientific experiments still needs the hands-on development of the experimenter himself,” he said. At present, Professor Xie still goes to the IHEP laboratory every Monday, where he communicates with young scientists. He is still active in the frontier of accelerator research and continues to contribute to sustainable development in high-energy and accelerator research. He summed up his 60-year-long scientific career in his autobiography, named A Journey That Will Never End. I am delighted to see this recognition for an admired and respected friend. He has made immense contributions to the development of accelerators in China, for high energy physics and photon science. It has been a privilege to know Xie for more than 30 years.